At Kitchen Compare, we’ve tried to shed light on the many different features and specifications built into today’s kitchen ranges. Working together with the national kitchen retailers and leading manufacturers, we have identified 22 different features that contribute to the 'quality' of each individual kitchen. These range from the various materials used to manufacture the doors and the cabinets, the thickness of the cabinet walls, the maximum weight that can be stored in the pan drawers, through to the length of the various kitchen guarantees. Door Material & ConstructionIt might sound obvious, but the materials used and the method of door manufacture have a significant impact on both the cost of your kitchen and how long the kitchen will remain looking as good as it did the day it was installed. Door FinishThe finish (and colour) of your door is what really brings out the beauty of your kitchen units. However, there's a significant difference in the quality of the materials used and it's really important you consider the nature and type of door finish, before making that final decision. Door GuaranteeRetailers offer a range of different product guarantees on their kitchen doors, bears no relation to the actual quality of the door, so check out the small print. As with cabinet guarantees, it’s important that you don’t just take the guarantee on face value. Ensure that you read the terms and conditions provided by each of the retailers, after all, the doors are being opened and shut on a regular basis and receive the most amount of wear and tear. 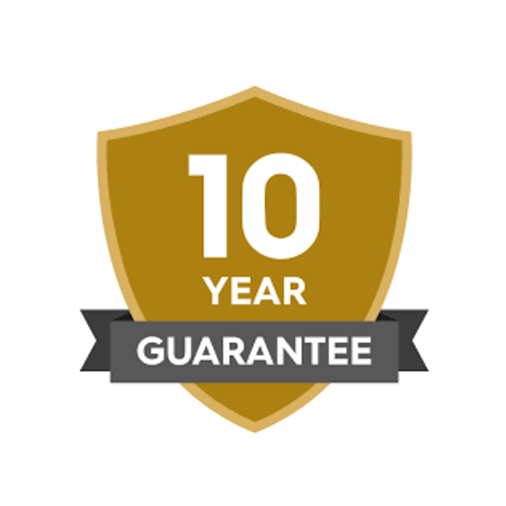 Door guarantees in general vary from 5, to 25yrs and some even claim lifetime guarantees. Door HingesEveryone loves the thought of having soft close hinges and closures on their new kitchen cabinets and doors. 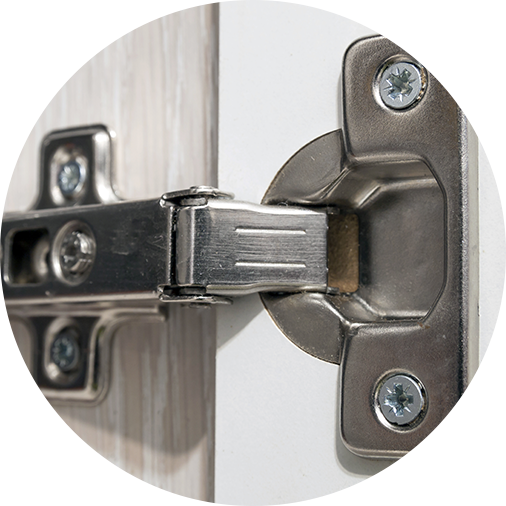 They're now widely available across the market and the majority of kitchen ranges now include soft close door hinges as standard, but some of these are imported soft close buffers and some are the genuine branded article. The later are by far the best quality and any kitchen that doesn’t have any form of soft close hinge or buffer as standard is lower in quality forming part of a retailer’s price entry range. FSC CertificationWe believe it's important to check that both the door and cabinet materials are being purchased from sustainable sources. 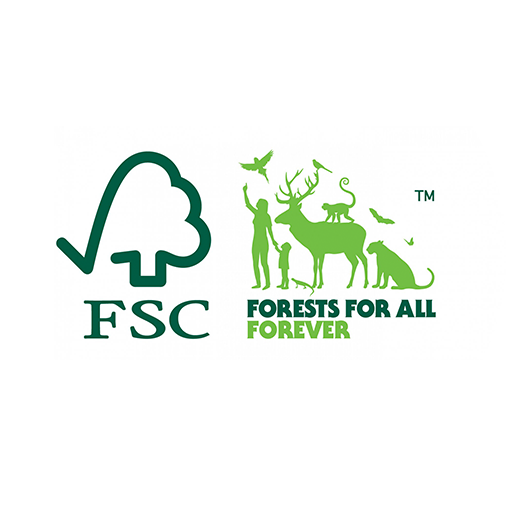 The Forest Stewardship Council (FSC) logo on a wood or wood based product is your assurance that it is made with, or contains, wood that comes from FSC certified forests or from post-consumer waste. There are three types of FSC label: 100%, FSC Mix or FSC Recycled. 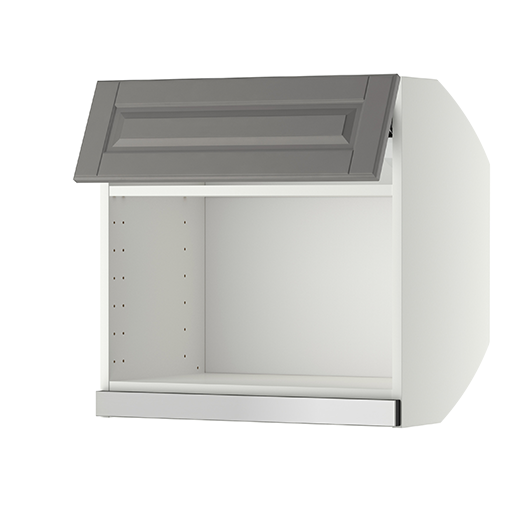 Cabinet Supply FormatThis refers to how the cabinet is supplied to you in your home. Kitchen units come in either a flat pack, semi constructed or fully constructed format. The flat pack units will arrive on a pallet and will take longer for either you or your kitchen installer to put together, whereas the constructed units will arrive already put together, including the door on the front, which makes installation quicker and easier. Cabinet ConstructionKitchen cabinets, both base and wall, can be constructed in different ways which result in some cabinets being more robust than others and this quality will be reflected in the pricing. The cabinet itself should be constructed from solid wood or a quality furniture grade of plywood. 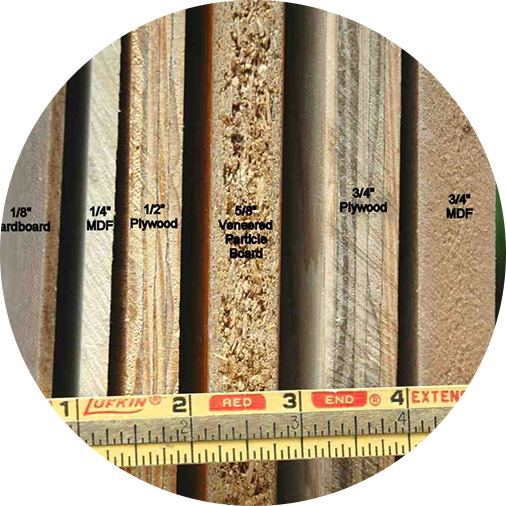 Cabinet Wall ThicknessThis is simply the thickness of the cabinet wall, top, sides and bottom and is normally either 15mm, 16mm or 18mm. 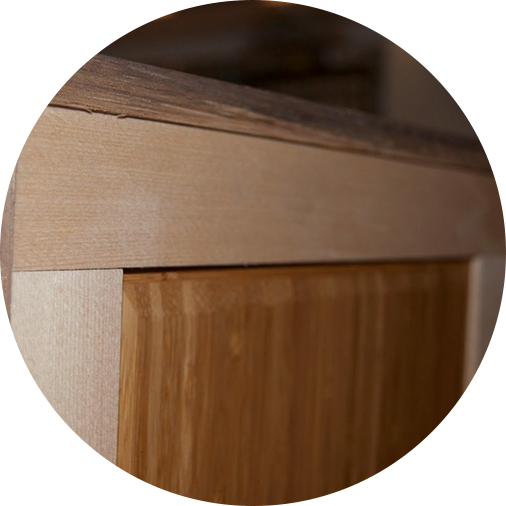 A 3mm difference between the highest and lowest specification is not a huge amount, but an 18mm cabinet will ultimately be more robust than a 15mm. Again, this is one area where retailers will choose to lower the kitchen specification to be more competitive on price. Cabinet Back Panel ThicknessThis is the thickness of the piece of wood covering the back of the base and wall cabinets, ranging from as little as 4mm thick up to a maximum of 15mm. 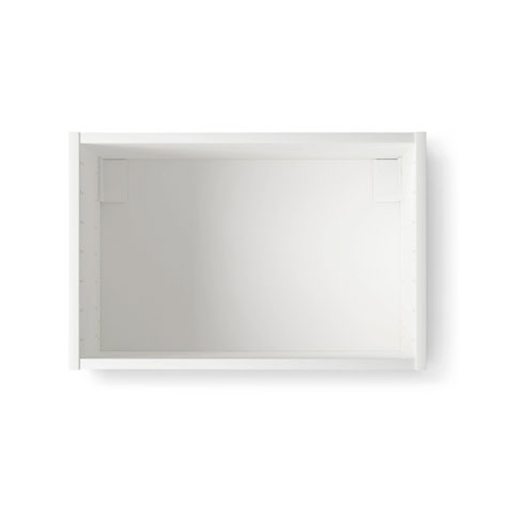 This can be quite important, as the 4mm option is simply a piece of hardboard which is tacked to the back of the cabinet, whereas a 15mm back panel will be solid wood, which would both look and feel better quality. Cabinet GuaranteeA guarantee is a good indication of a retailer’s confidence in the quality of the products that they are selling and ranges between a 1 year guarantee to a 25 year guarantee. However, it’s important that you don’t just take the guarantee on face value. Ensure that you read the terms and conditions provided by each of the retailers as often the guarantees have a large number of exclusions and sometimes require you to clean the kitchen with a specific type of cleaner to honour the guarantee. Range of CabinetsA good indication of the quality of a kitchen range is the number of cabinet options that are available. That may sound a bit odd, if you think you only need 8 floor and 5 wall cabinets, but in actual fact, depending upon the dimensions of your room, you may need a broad range of cabinet sizes and specifications to ensure that you will achieve a perfect fit. To keep costs down, some retailers will offer only a limited range of cabinet options on their price entry ranges. In some cases the limited range of sizes available may mean that the range won’t fit the space available and you may have to opt for a better quality range. A more limited range will generally offer less than 30 different types of cabinet whilst other ranges can offer more than 60 different types of cabinet! Cabinet Colour and FinishThe colour and finish is what really brings out the beauty of the cabinets. There are many different finishes to choose from, so it is easy to find the perfect finish to complement almost any style and design, but as with so many other elements, the materials used and the complexity involved in the application of the colour and finish have an impact on quality and hence final price. Wood tone finishes are available in many different shades ranging from natural to very dark. A wood tone finish usually helps enhance the natural beauty of the wood which the cabinets are made from, and it emphasises individual characteristics. Buying kitchen cabinets with a coloured finish is a great way to create a unique look. Coloured finishes are available in many different shades including yellows, reds, greens, and blues. Colour finishes are usually opaque instead of translucent. 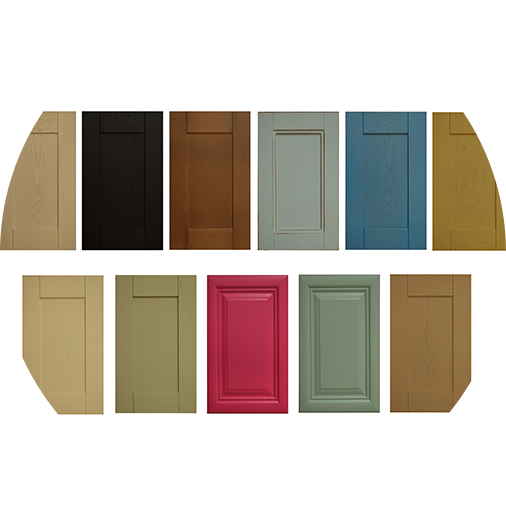 As the most visible element, it is best to chose door style first and then look for a cabinet colour that best matches or goes with your chosen door. 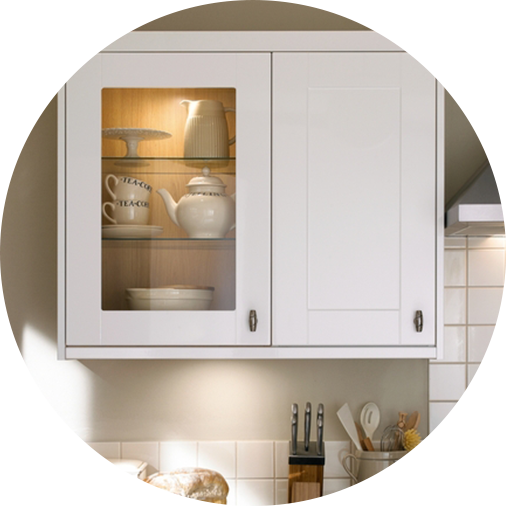 A cabinet colour match gives a much better effect when opening the cabinet doors on the interior but can also save on the cost of end panels where an exposed side of the cabinet is visible. Base Unit Service VoidA service void can only apply to a base unit. 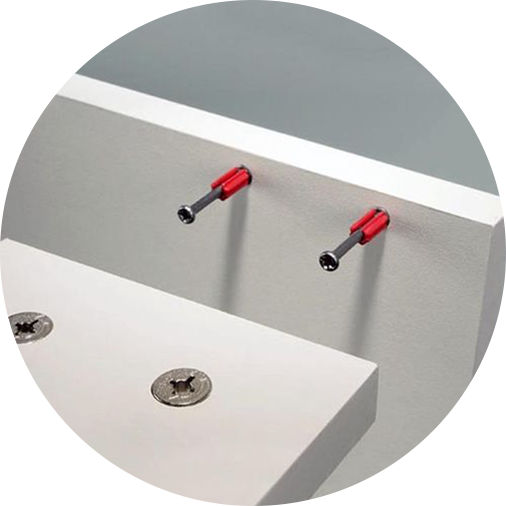 Check carefully whether or not your base unit has a service void – this is a gap at the back of the unit that enables the installer to have enough space to work with and fit the pipes and cables. Some base units don’t. These units are generally cheaper, but it makes installing the services more difficult and therefore the installation can become more costly. A lack of service void will also mean that the pipe work will be visible unless your installer is creative in finding ways to hide it, which will probably also result in higher installation costs. Base Unit Drawer ClosuresWe all love soft close doors and drawers and wonder how we ever lived without them. 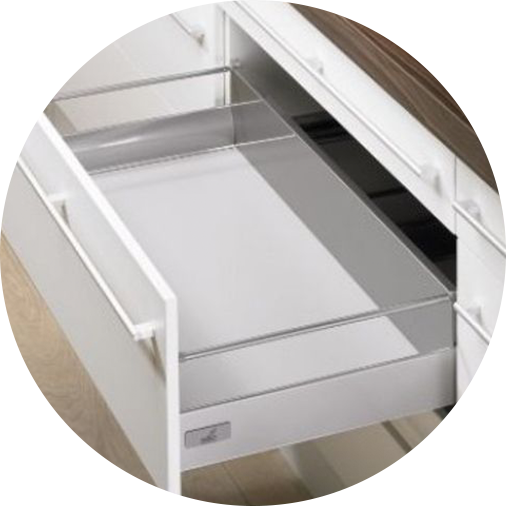 The majority of kitchen ranges now include soft close drawer closures as standard, but some of these are imported soft close buffers and some are the genuine branded article. 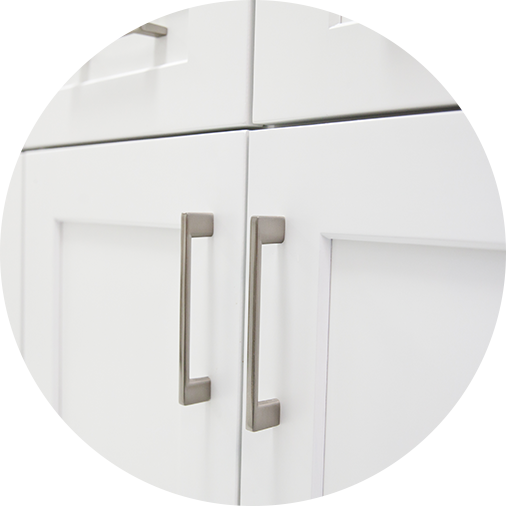 The later are by far the best quality and any kitchen that doesn’t have any form of soft close hinge or buffer as standard is lower in quality forming part of a retailer’s price entry range. 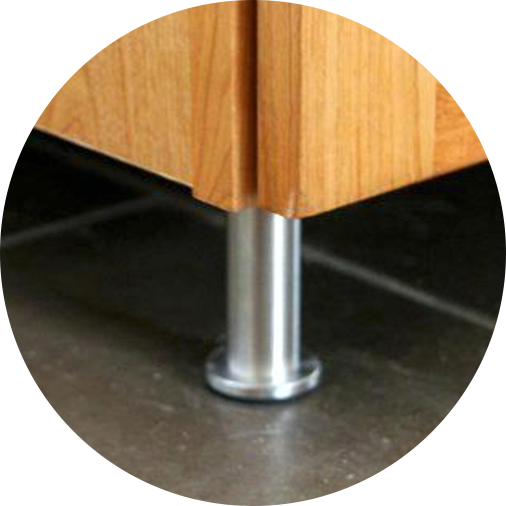 Height adjustment on cabinet base unitsNo two kitchens floors are the same and for this reason base units nearly always come with adjustable legs so that the correct height can be obtained for each unit to compensate for uneven floors. Once your base units are the correct height then the matching plinths are attached to the unit legs. Just double check that your base unit legs are fully adjustable. Wall Unit DepthOften described as the ‘Dinner Plate’ test, this relates to the depth of the wall cabinets, basically, how far they come out of the wall. 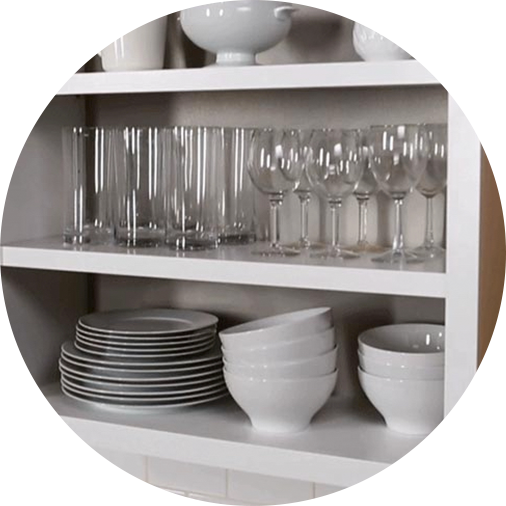 The reason for this being referred to as the ‘dinner plate’ test is because some kitchen wall units are deep enough to accommodate a full size dinner plate and some surprisingly aren’t. As a guide, any wall unit with a depth less than 310mm, won’t be able to accommodate a standard dinner plate. Again, this is a way in which retailers can reduce the cost of their kitchens to be more competitive. Wall Hanging BracketsThese are the brackets used to attach the wall cabinets to the wall. Better quality kitchens have brackets that not only are adjustable (making hanging the wall units easier) but are also concealed. This means that they’re not visible when you open the cupboard and look inside. A lower quality kitchen will have a non-adjustable bracket and will be permanently on show. Shelving Height AdjustmentsThis is the number of pre-drilled holes in the side of the base and wall cabinets. These enable you to re-position your shelves at different heights. Some units have less than three positions and some have four or more. The more pre-drilled holes, the more flexibility you have for storing everything you need in your kitchen. 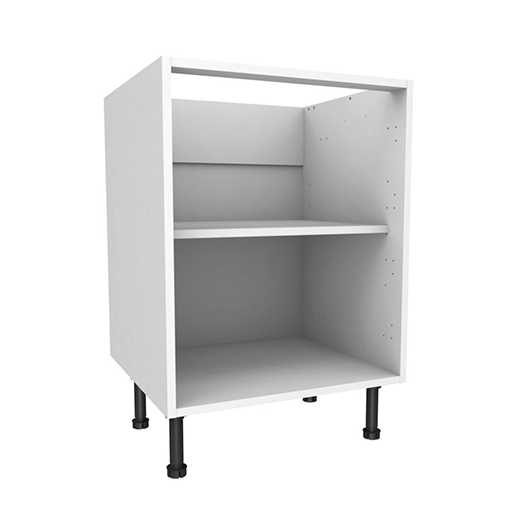 Anti-tilt and slide shelf fixingsMost kitchen unit shelves are moveable and can be adjusted. However, once in situ, shelves can have a tendency to rock a little if heavier items are placed on them and they become unbalanced. 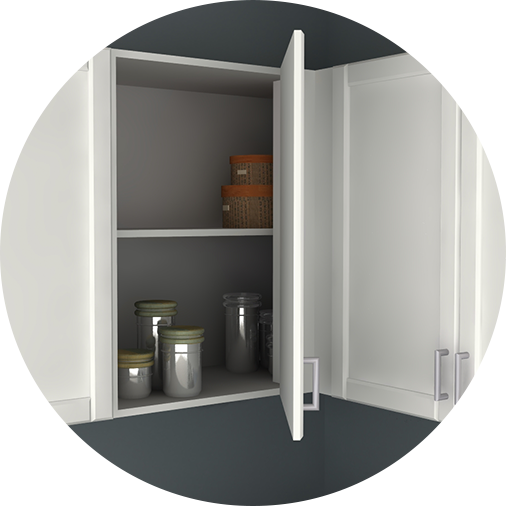 This can be an issue if trying to store heavier ceramic or glass items such as plates, casserole dishes, or jugs. A better quality kitchen range will ensure that the shelves have anti-tilt fixings which are usually made of plastic or metal. The shelf is designed to sit comfortably on these and shouldn’t tip. Pan Drawer Weight LimitThe weight that a base unit pan drawer can take is a good indication of the quality of the kitchen drawers and the runners. 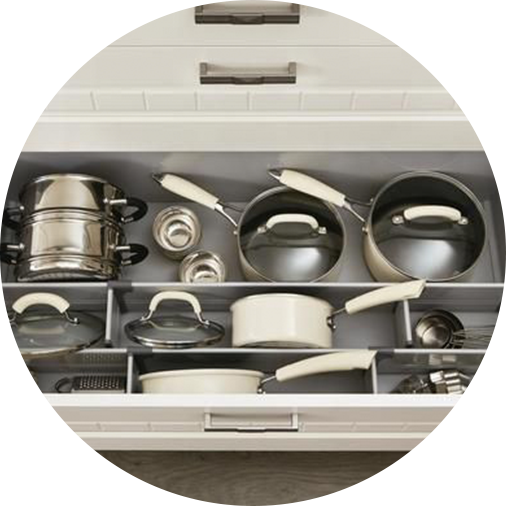 If you intend to store your Le Creuset pans in your bottom drawer, you may want to ensure that the drawer can support more than 25kg in weight. 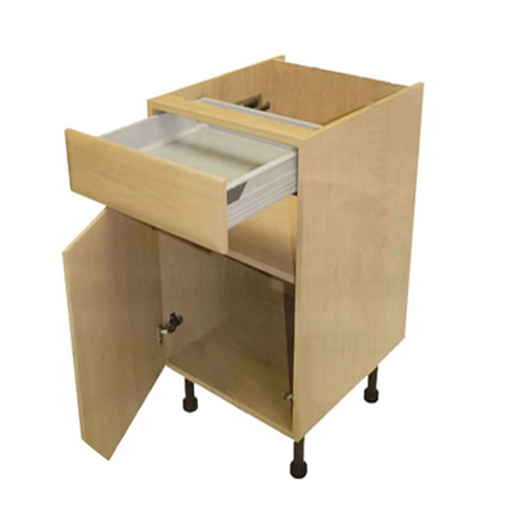 Fully Extendable DrawersAll quality drawers should have solid sides and bottoms. 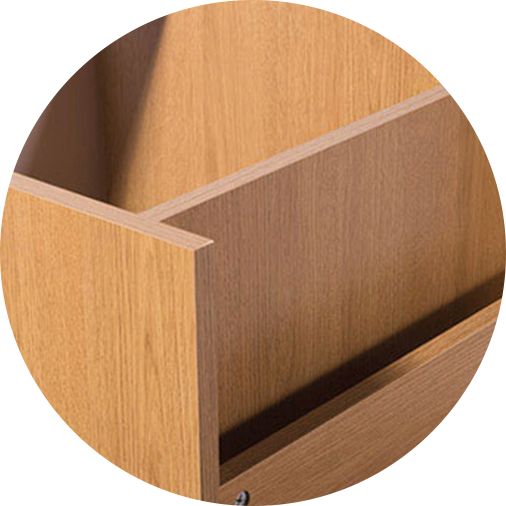 There is nothing more frustrating than not being able to reach to the back of a drawer to get hold of something you need, so look carefully at how far the drawers extend. 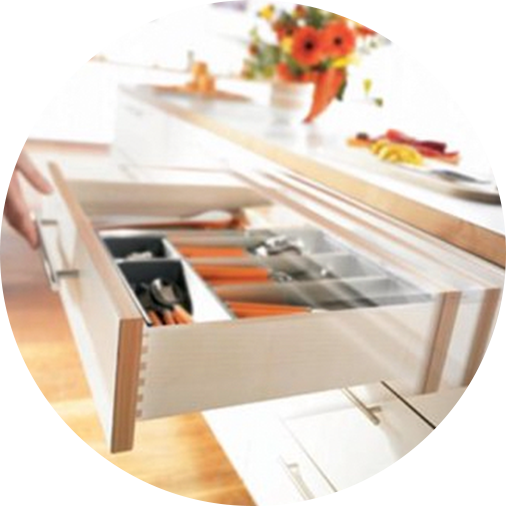 Drawers which extend to three quarters or more are recommended because they offer easy access. FIRA Gold Product CertificationFIRA stands for the Furniture Industry Research Association and the FIRA Gold Product Certification scheme is the independent third party product validation scheme for the furniture industry. The FIRA Gold Product Certification scheme covers all types of furniture and components and is the mark for product excellence. 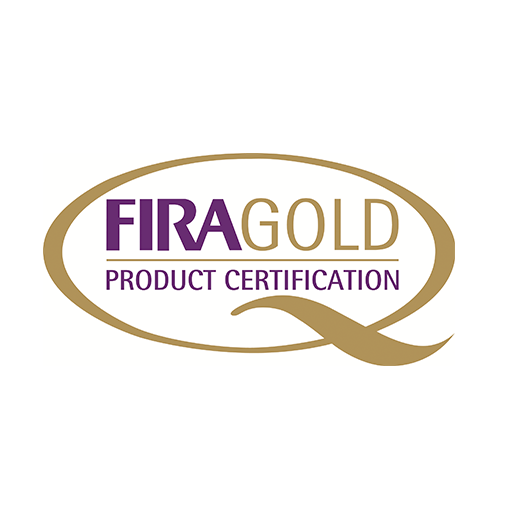 FIRA Gold Product Certification has rigorous test requirements for the products covered, backed by an ongoing audit and re-test programme to ensure that a particular product having achieved the FIRA Gold certification maintains the standard.